Elsewhere is an exceptionally beautiful villa that sprawls on the Sandy Lane Estate on Barbados' famed Platinum Coast. Built as a "labour of love" twenty years ago, it has Mediterranean style architecture with stucco walls and terracotta tiled roof that encompass terraces, balconies, patios and courtyards. The villa extends over three wings affording plenty of privacy to guests. There is the Main House with four bedrooms, the Pool House with two bedrooms and the Garden House with another two bedrooms. Each wing has adjoining gardens and its own special terraces and lounging areas. All together, there are eight en-suite bedrooms that sleep 16 people. Elsewhere has the ability to magically transport you, with treetop views, that lead to the heaving ocean beyond. The garden was designed by the Venezuelan landscape architect, Fernando Tabora who has interwoven a series of gardens in varying shapes and sizes to form a continuous whole. In the process, vistas have been created. There are shaded nooks and crannies, and features such as a Japanese bridge over a waterfall and a running stream that flows into a lily pond full of koi-carp. At night, tree-uplighters and subtle fairy lights wreak their magic, and the garden becomes a perfect place for a party. 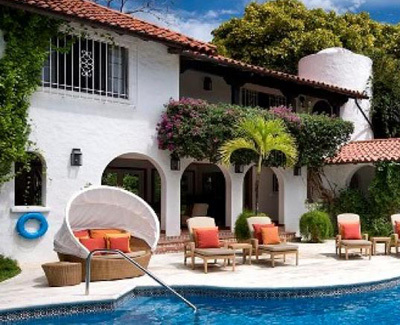 Between the main house and the east wing is a freeform swimming pool adjoining an inviting covered patio furnished with deep sofas, board games and a bar. Those wishing to head to the beach benefit from priviledged access via a card to Elsewhere's cabana on the Sandy Lane beach next to the Sandy Lane Hotel. The Sandy Lane Hotel's spa and tennis courts are just around the corner. Children are welcome at Elsewhere - they will enjoy exploring the many facets of the villa, specially its secret limestone cave and its ancient mahogany grove. Green monkeys visit every morning, tree frogs trill at night, there are mangos and avocadoes to be plucked and a storehouse of children's books awaiting discovery in the study. Debra, the in-house chef likes to pamper guests, turning each meal into an adventure by serving different dishes atop different crockery in different locations. After remaining closed for a year for refurbishment, the villa has only just re-opened. Designer Lynne Pemberton has done an exquisite, top-of-the-line makeover using Louise Bradley chandeliers, Ralph Lauren furniture and Missoni accessories, turning the interiors into stunning yet inviting spaces. The chef, housekeeper and gardeners take pride in making Elsewhere a home away from home. Once you have stayed here, no matter where you go, you will always want to be Elsewhere.